You can stop hunting for the perfect Easter gift - it's right here! This beautiful, jaw-dropping basket is filled with an impressive collection of the most beloved classic candies, decadent chocolate treats, and entertaining games that are guaranteed to make this Easter morning one they'll never forget. Exclusively from GourmetGiftBaskets.com! You can stop hunting for the perfect Easter gift - it's right here! 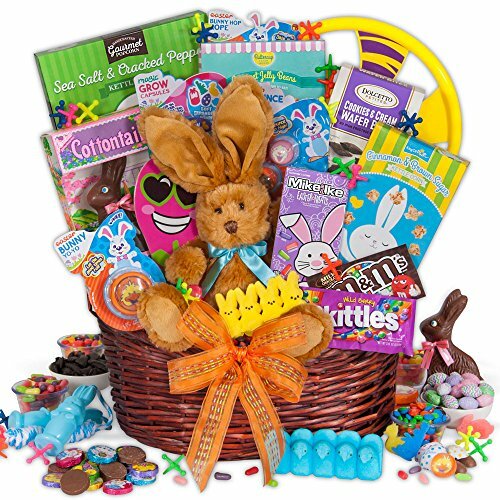 This beautiful, jaw-dropping gift basket from GourmetGiftBaskets.com is filled with an impressive collection of the most beloved classic candies, decadent chocolate treats, and entertaining games that are guaranteed to make this Easter morning one they'll never forget. a jump rope, Easter Magic Grow foam Capsules, rubber bouncy balls, an Easter Bunny Paddle Ball, a Frisbee, an Easter Bunny Yo-Yo, and Big Rainbox Jax!